[122 Pages Report] Fireproof Insulation Market size is expected to grow from USD 18.16 Billion in 2015 to USD 23.79 Billion by 2021, at a CAGR of 4.6% from 2016 to 2021. The report aims to analyze and forecast the market size, in terms of value, of the fireproof insulation market. The market has been segmented on the basis of application, material, and region. The report also aims at providing detailed information regarding the major factors, such as drivers, restraints, opportunities, challenges, winning imperatives, and burning issues that may influence the growth of the market. The report strategically analyzes subsegments of the market based on individual growth trends, future prospects, and contribution to the total market. It also strategically profiles the key players and comprehensively analyzes their core competencies. This research study involves data from both secondary and primary sources. Secondary sources include directories and databases, such as Factiva, Bloomberg, Businessweek, and Hoovers are used to collect and identify the information for this technical, market oriented, and commercial study of fireproof insulation market. Primary interviews were conducted to validate the critical information collected from the secondary sources. The breakdown of primaries conducted in shown in the figure bellow. 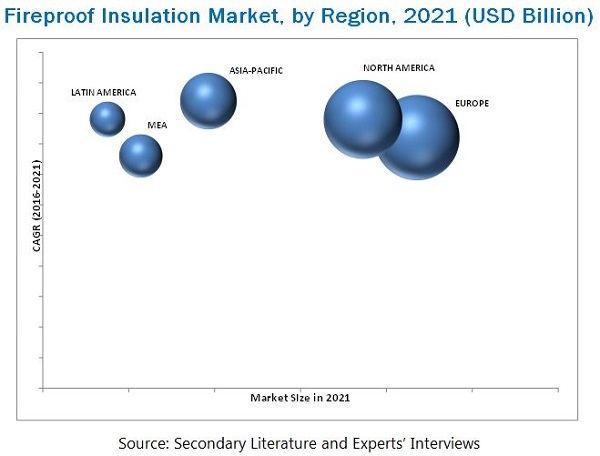 The ecosystem for fireproof insulation market consists of key suppliers, including fireproof insulation manufacturers, such as Rockwool International A/S (Denmark), Knauf Insulation GmbH (Germany), Saint-Gobain S.A. (France), Owens Corning Corporation (U.S.), Berkshire Hathaway, Inc. (U.S.), BASF SE (Germany), and Paroc Oy (Finland).These companies manufacture fireproof insulation materials that are used in the commercial as well as residential construction sector across the globe. The global fireproof insulation market was valued at USD 18.16 Billion in 2015, and is projected to reach USD 23.79 Billion by 2021, at a CAGR of 4.6% from 2016 to 2021. Stringent building codes in developed countries, greenhouse gas emission reduction, cost efficiency, strict regulatory environment, rebates and tax credits, and increased demand from new constructions are some of the factors that are expected to drive the growth of the fireproof insulation market during the forecast period. The residential buildings application segment led the global fireproof insulation market in 2015. This can be attributed to the large number of residential buildings construction. Residential buildings such as townhouses, condominiums, cottages, subdivisions, single unit dwellings, and apartments are the places where people spend a considerable part of their time, hence there is a need for fire safety in such places. This has led to an increased adoption of fireproof insulation in residential buildings. Glass wool, stone wool, plastic foam, and others are the major insulant materials used in fireproof market. The glass wool segment contributed the largest share to the market in 2015. This large share of the segment can be attributed to its properties such as superior fire safety (class 0 and class 1), ease of use, physical stability, and environment-friendliness of glass wool. Glass wool also possesses superior insulation in a wide range of temperatures ranging from -30 °C to 540 °C. The Europe region led the global fireproof insulation market in 2015. Asia-Pacific is expected to be the fastest-growing market for fireproof insulation during the forecast period. This growth can be mainly attributed to the growing demand from the construction industry from countries such as China, Japan, and Indonesia in the region. However, factors such as slow growth of the construction sector in Europe and lack of awareness about the insulating materials may restrain the growth of the global fireproof insulation market. Rockwool International A/S (Denmark) is one of the most active players in the global fireproof insulation market. The company expanded its business in different regions to increase its global reach and cater to the diversified demands of its customers. The company also made efforts to modify and innovate its product series over the last five years. Owens Corning Corporation (U.S.) also expanded its production facility in Joplin, Missouri, U.S. Companies operational in the market have been focusing on improving the quality of their products and services by introducing new and advanced products in the market. 11.11 Beijing New Building Material (Group) Co., Ltd.